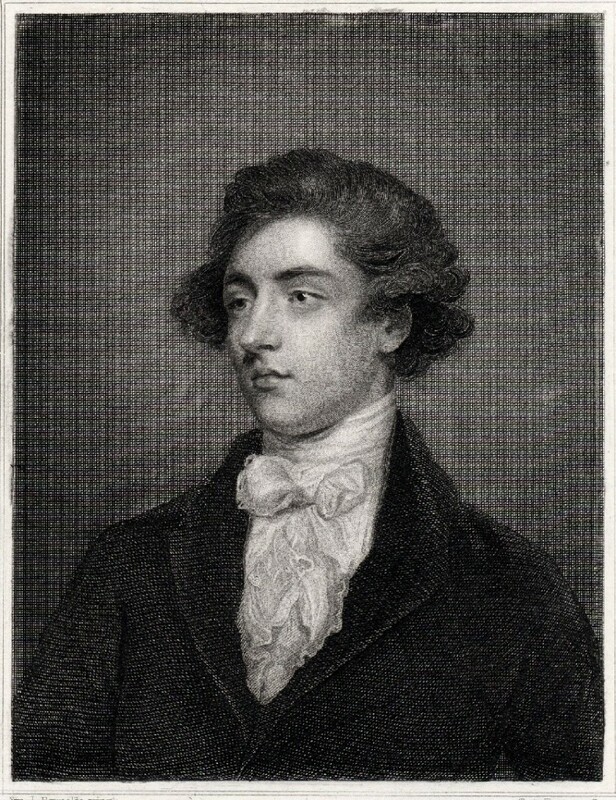 Born to great wealth and endowed with precocious talent, William Beckford (1760-1844) was a character around whom legends grew, even in his own lifetime. Beckford’s name will always be linked to Fonthill Abbey, the great neo-Gothic house designed by James Wyatt, and built on Beckford’s Wiltshire estate. Less well known is Lansdown Tower, or ‘Beckford’s Tower’ as it is more affectionately known today. After selling Fonthill Abbey in 1822, Beckford moved to Bath where he continued to indulge his taste for building, landscape gardening, collecting and creating magical interiors. For the last 22 years of his life he pursued these interests with his usual passion and impetuousness, assisted by the young Bath architect Henry Edmund Goodridge. Beckford purchased the land behind his home in Lansdown Crescent to create a mile-long ride through a series of gardens and landscaped features to the summit of Lansdown Hill, where he built a 120-foot high neo-classical tower, crowned with an octagonal lantern decorated with gilt gold columns. The two main rooms at the base of the Tower, the Scarlet and Crimson Drawing Rooms, had rich carpets, luxurious curtains, and coffered ceilings panelled in oak and enriched with scarlet, crimson, purple and gold. The spiral staircase with its 154 steps leading up to the Belvedere was carpeted and at the centre of the stairwell stood a colossal vase of polished granite. 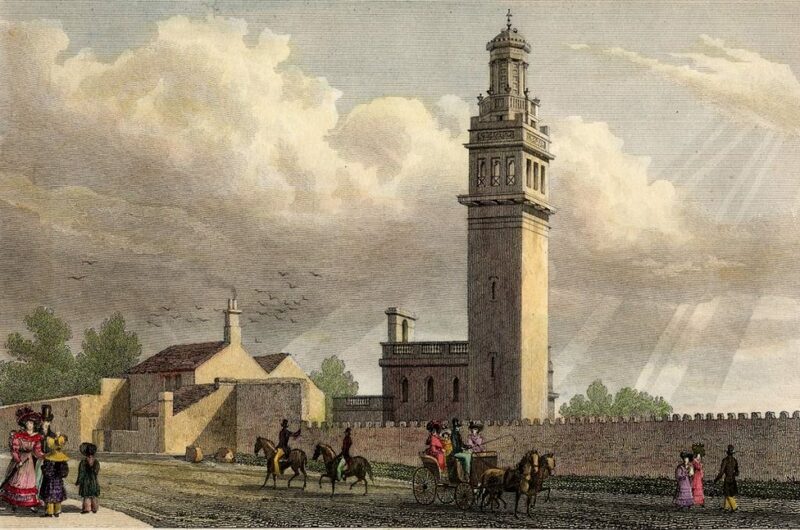 When Beckford died in 1844 the Tower and Gardens were sold to a Bath publican. Beckford’s daughter, the Duchess of Hamilton, was horrified to discover that her father’s retreat was being used as a beer garden and promptly bought it back, passing it to the Rector of the Parish of Walcot in Bath. The Tower became a funerary chapel and the Tower garden became a cemetery. The Tower was sold in 1971 to the late Leslie and Elizabeth Hilliard, who in 1977 established the Beckford Tower Trust whose object was to maintain for public benefit the buildings, features and objects of historical and architectural interest relating to the life of William Beckford. Since 1993 the Tower has been owned by the Bath Preservation Trust. Beckford’s Tower was designed by Henry Edmund Goodridge in 1825 and completed in 1827 for William Beckford (1760-1844), one of the nation’s most accomplished and interesting characters. The 120-foot neo-classical Tower, which enjoys uninterrupted views of the countryside, was constructed as a study retreat and to house Beckford’s precious collection of art and rare books. The surrounding Victorian Cemetery, containing William Beckford’s tomb, was in his lifetime part of a beautiful pleasure garden known as ‘Beckford’s Ride’, which ran from his house in Lansdown Crescent up to the Tower at the top of Lansdown Hill. The Tower is now home to a museum collection displaying furniture originally made for the Tower, alongside paintings, prints and objects illustrating William Beckford’s life as a writer, collector and patron of the arts. Visitors can follow in Beckford’s footsteps and climb the spiral staircase (pictured) to the beautifully restored Belvedere and experience the spectacular panoramic view of Bath. The Tower is an extraordinary building that stands today as the only surviving example of William Beckford’s great architectural achievements. Steeped in history and with an intensely emotive atmosphere, a walk through Lansdown Cemetery enhances any visit to Beckford’s Tower. When the Tower became a mortuary Chapel for the parish of Walcot the land that once made up the Tower gardens, the final part of Beckford’s Ride up to the Tower from Lansdown Crescent, became a cemetery. 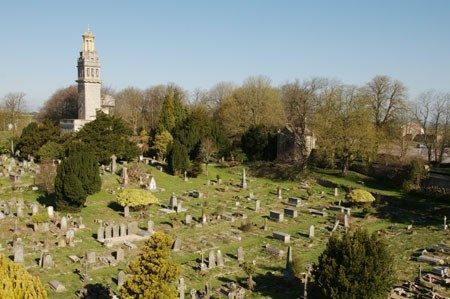 Now the site of over 5,000 graves, the Lansdown Cemetery is the final resting place of some of Bath’s most significant residents, including the architect of the Tower, H.E. Goodridge. Beckford’s monumental marble tomb sits isolated on its own island, surrounded by elaborate and interesting memorials. The Beckford Tower Trust, in partnership with Bath and North East Somerset Council and Walcot Parish, is dedicated to the restoration of these monuments and the continuing conservation of the surrounding ecology and landscape of Lansdown Cemetery. Beckford’s Tower has a significant library collection and archive about the restoration of the Tower building that is available to researchers by appointment. The library includes works by Beckford and books once owned by Beckford, as well as an extensive collection of publications related to Beckford’s writing, his architecture, and his collection. For online access to several works relating to Beckford and Fonthill Abbey, visit the Beckfordiana website. When William Beckford left England in 1785 he entered a period of exile that would last a decade. Having been one of the most celebrated members of 18th century society, for the rest of his life he would be a social outcast. The reason for this exile was the exposure of his relationship with William ‘Kitty’ Courtenay, the heir to Powderham Castle in Devon. For Beckford, the exposure of this homosexual relationship threatened not just social exile, but the risk of imprisonment and execution. Certain sexual acts between men had been defined as criminal and punishable by death since 1558, when Elizabeth I reinstated Henry VIII’s 1553 Buggery Act. During Beckford’s youth the high profile case of Captain Robert Jones in 1772 had resulted in England’s first public debate about homosexuality. In Beckford’s lifetime the only way to escape the threat of arrest was to escape the country. Exile from England, and more importantly from his home at Fonthill in Wiltshire, had a powerful impact on the rest of Beckford’s life. His time spent in exile influenced everything from the evolution of Fonthill Abbey and its landscape in the 1790s, to the creation of his retreat from society in Bath at Lansdown Tower (more commonly known as Beckford’s Tower). 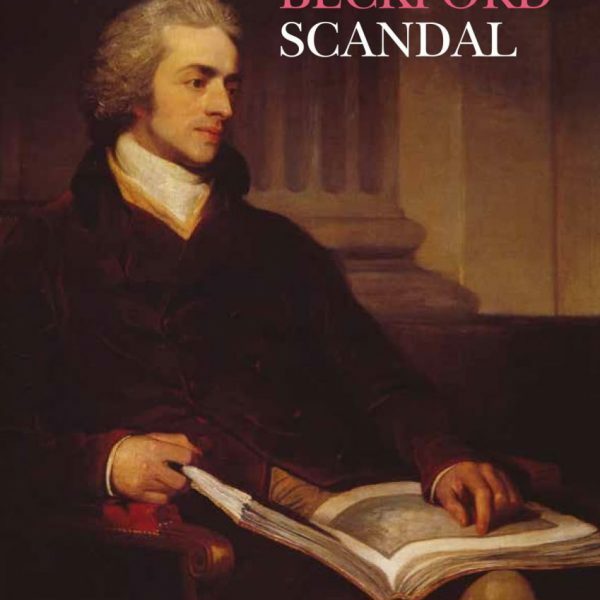 Read this fascinating booklet called The Beckford Scandal to learn more. The history of the Beckford family is a tale of social ambition, political manoeuvrings and inexhaustible collecting all made possible by a huge family fortune built on the back of the slave trade. ‘Our’ William Beckford was the only legitimate son of Alderman (William) Beckford, who as head of the Beckford family owned 13 Jamaican plantations, over 22,000 acres of land and 3,000 slaves. He was ostentatious in his displays of wealth, despite success in politics and marriage into one of the great aristocratic families. He died in 1770, when his son was just 9 years old. William inherited everything. Read more about how the Beckfords made, spent and then lost their fortune – not helped by the abolition of slavery in 1838, six years before William’s death. “One of my new estates in Jamaica brought me home seven thousand ponds last year more than usual. So I am growing rich and mean to build towers’.